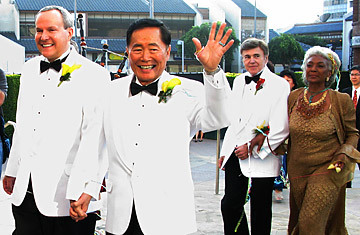 George Takei and his partner Brad Altman after they were married in Los Angeles in September, 2008. George Takei is famous for portraying Mr. Sulu on Star Trek, but the actor  who has a recurring role on NBC's Heroes  has also earned widespread acclaim for his success as an activist for the gay community. In the wake of the passage of Proposition 8, a ballot measure banning the recently earned right of gays to marry in California, Takei spoke to TIME about the future of marriage equality. Obviously this is a setback for supporters of gay marriage. Was it a fight you expected to win? I knew the way Proposition 8 was going. Our side was losing. The thing that gave me hope was that Proposition 8 got only 52% of the vote. I say only because eight years ago, there was another initiative to ban marriage equality and that got 61%. So the percentage is coming down. We know that we have a long road ahead, but we are making progress. It was stirring to see President-elect Obama speak on Tuesday. I was involved in the Civil Rights movement in the 1950s and 60s, and I'm certainly mindful of the whole history of the African American struggle for equality. Civil rights was never an easy thing to do, and it didn't happen overnight or even in one generation. I know that this is going to happen in our generation, though. It happened for Brad [Altman, Takei's husband] and me. We are married, and we are confident in the validity of our marriage. It's interesting that you mention Obama, because while he did not support Proposition 8, he is also not in favor of full marriage equality. But he is for equal protection under the law. You don't amend the constitution of any state by threatening the very core of that constitution: equal protection under the law. Proposition 8 is an attack on our constitution and our judiciary. It's not an amendment; it's a revision. It's about taking a core value of the constitution out. It's like taking freedom of speech away from redheads. So you're hopeful about witnessing real improvements during his presidency? People will change. Their thinking will change. When you look at the results of this election on Prop 8, the people that supported it were older people. Those under 30 were overwhelmingly for defeating it. There's hope. As an activist, what have you found to be the most effective strategy in persuading people who are on the fence about gay marriage? What we needed to do was to have dialogue with people of faith. As it turned out, they were the ones that supported Prop 8. I am a Buddhist. We live in a pluralistic society. What's essential in a pluralistic society is mutual respect. There are Christians who support marriage equality, Jews, Hindus. People of faith are decent, fair-minded people, I'm convinced. We failed in [initiating] that dialogue as a campaign. What other tactics will you use to make strides in this battle? Challenges to Proposition 8 will be a key tool in our arsenal. Having dialogue with people who voted against us is going to be an important part. We also need to become much more sophisticated in conducting campaigns. We didn't respond quickly and incisively to some of the mistruths and fearmongering of the "Yes on Prop 8" campaign. They were masterful at some of the most despicable kind of campaigning. We have to know how to respond to that while still maintaining our integrity. How dispirited will supporters of marriage equality be at the result of this ballot measure? There will always be people who become dispirited, but that doesn't mean we all will. The Civil Rights movement didn't happen with the people who were easily dispirited. When you were standing up against Bull Connor's dogs and water hoses, you had to be strong. You had to be resilient. It's those that have confidence and belief in their position that are the ones who will advance our cause. Completely switching gears to a lighter note, can you talk a little bit about the origins of your relationship with Howard Stern? I was doing a play in New York and I was assigned to talk about it on his radio show. "Howard Stern" didn't mean anything to me; I didn't know him from Adam. Here's a skinny, wild-haired guy with owlish glasses. I can verbally fence, and he kept asking me back. I talked earlier about free speech as a core value in our democracy. He not only believes in it, he exercises it. We need people like that, particularly at a time like this. What are your expectations for the J.J. Abrams Star Trek remake? I had the chance to have breakfast with him recently. He's got tremendous ideas. His energy and enthusiasm  and his understanding of the ideals of Star Trek  are really there. I think it's going to be an exciting movie. Speaking of Star Trek, you had a fairly high-profile feud with William Shatner recently. It's just silliness. Yes, we found it difficult to work with Bill, and I mentioned it in my autobiography. So I was invited to participate in his roast on Comedy Central a few years back. When the press asked if Bill was going to be invited to our wedding, we said we had to cull the list down to 200. So the press went on to assume Bill was not going to be invited. But we wanted to be as inclusive as possible, so we shoehorned him onto our list and he was sent an invitation. But we got no response to the RSVP. So we offered his two seats to someone else. Weeks after, there he was ranting and raving that he wasn't invited to our wedding. I was just aghast. Has he gone bonkers? But you know, I extended another invitation to him: on Entertainment Tonight, I invited him to join in our campaign against Proposition 8. True to history, he never responded.